Ayya Santacitta has practiced meditation since 1988. Her first teacher was Ajahn Buddhadasa, who sparked her interest in Buddhist monastic life. 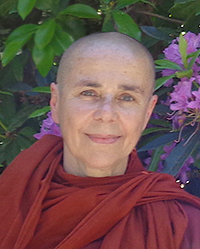 She has trained as a nun in both the East and West since 1993, primarily in the lineage of Ajahn Chah. Since 2002 she has also received teachings in the lineage of Dilgo Khyentse Rinpoche. Ayya Santacitta is co-founder of Aloka Vihara Forest Monastery and received bhikkhuni ordination in 2011. She is particularly interested in creating sanctuary close to nature, practicing in community, and bringing wisdom traditions to the environmental movement. Visit www.alokavihara.org for more information. View Ayya Santacitta's upcoming programs.